As with our "ready mixed" water based inks, Our Pyramid Base & Pigment concentrate still offers the ultimate in flexibility when it comes to screen printing onto various substrates such as T-Shirts, T-Towels, Baby Clothing, canvases etc... giving the ultimate in soft feel. 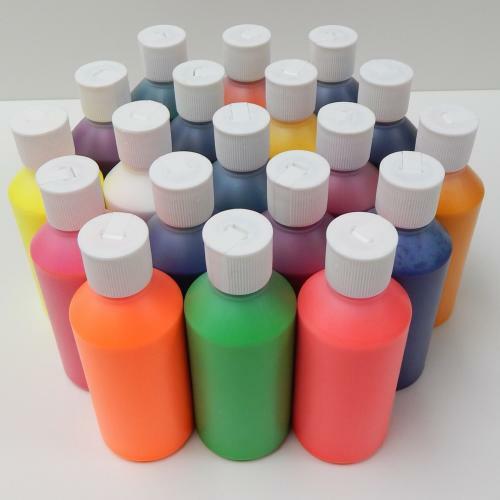 Unlike most other pigment systems on the market that require an 8-10% pigment ratio, our system only requires a 4-5% ratio, thus making the cost very competitive when added to our Water Based or Discharge Bases. We recommend 120 seconds at 170 degrees C.For best stencil results, we recommended the use of Pyramid Textile Dual Cure Emulsion coated on screen mesh counts of 34 - 43T with a 2 + 2 emulsion coating.Pyramid Screen Products endorse best industry practice that operators should wear appropriate personal protective equipment (PPE) when handling all chemical products, even those classified as 'non-hazardous'. PPE for Pyramid Products includes gloves and safety glasses/goggles.